This is one of those eighties cop buddy movies where everyone is trying to unleash lame wisecracks every couple of seconds. It would be indistinguishable from the action flick crowd except for the fact that the bad guys are zombies, there's a fair bit of gore and Vincent Price pops up. All of which drags it into the horror genre, somewhat reluctantly. If you like hammy acting and a cheesy script this is the kind of bad movie that should appeal. 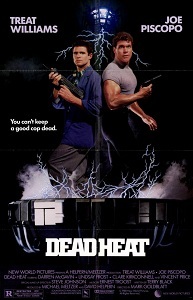 Your buddy duo is Treat Williams and Joe Piscopo and there's quite a large supporting cast, but thankfully no one is labouring under the apprehension that this is a serious film. The zombies are henchmen for a trio of villains with a machine that can bring you back from the dead and even offer immortality. Everyone in the film has an Uzi (obviously an essential accessory in the eighties) and the special effects and gore are pretty well handled. It doesn't really make sense and it's not funny in the way it intends to be, in fact it's pretty awful and yet somehow it manages to be nostalgically entertaining.